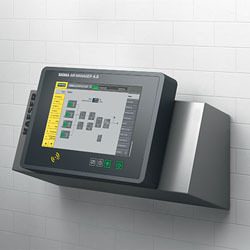 Sigma Air Manager (SAM) 4.0 is a master control system for all air production equipment. It automatically adjusts system air delivery to accommodate fluctuating air demand and the dynamic needs of a wastewater treatment plant’s aeration process. It also optimizes system efficiency to boost operation reliability and significantly reduce energy costs. It is compatible with the company’s blower packages, which are designed for wastewater service and offer wire-to-air efficiency.